This manzanita is naturally occurring hybrid between bristly manzanita and kinnikinnick. 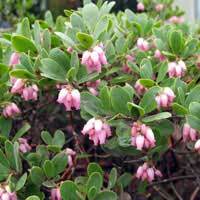 Its bluish-green leaves and pink flowers make this an attractive evergreen ground cover. Since it rarely grows up to 3 feet in height, is a nice ground cover where low shrubs are desired, but you are looking for something other than kinnikinnick.. It requires good drainage, and is not very common in the nursery trade (yet).